Sri Lanka Podujana Peramuna (SLPP) MP Lakshman Yapa Abeywardena yesterday said that MP Mahinda Rajapaksa would make a decision on whether to remain or step down based on the Supreme Court decision expected later this week. “If the Supreme Court rules against the Gazette dissolving Parliament issued by President Maithripala Sirisena, Mahinda Rajapaksa will make a decision, but at the moment neither Mahinda Rajapaksa nor the United National Party (UNP) has 113 seats in Parliament. Therefore Mahinda Rajapaksa doesn’t have any intention of holding onto the Premiership without a majority in Parliament,” MP Abeywardena told reporters at SLPP headquarters. He said that various parties informed MP Mahinda Rajapaksa to refuse the Premiership at this time. “It was President Maithripala Sirisena who invited Mahinda Rajapaksa to accept the Premiership, and Mahinda Rajapaksa made that decision considering the political situation that prevailed at the time,” he added. Abeywardena emphasised that a General Election would be the only way to resolve current political turmoil in the country. He also expressed regret for voting in favour of the 19th Amendment in 2015. “UNP had changed some clauses of the 19th Amendment moments before it was tabled. Therefore we didn’t know what the last moment changes were,” he claimed. However, the UNP has refuted allegations that any changes were made at the last moment. 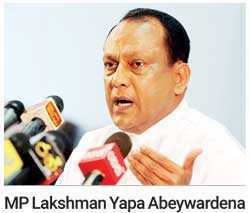 Abeywardena noted that the UPFA’s decision to vote in favour of the 19th Amendment came on the agreement to establish independent commissions, expecting to strengthen the democratic process of the country. Responding to a question on the SLPP’s point of view over alleged payments made to Dambara Amila Thero by Litro Gas Company, he insisted that a special investigation is needed regarding the allegations. “If we were able to come back to power, we would not conduct any investigation, which the UNP followed during the past three-and-a-half years. We will follow proper procedures to investigate if they have done any irregularities,” he added. When asked about Fitch Ratings’ decision to downgrade Sri Lanka’s Long-Term Foreign-Currency Issuer Default Rating (IDR) to ‘B’ from ‘B+ , he charged that Fitch Ratings’ decision was precipitated by the United National Party’s (UNP) criticisms of the economy and not the ongoing political turmoil.